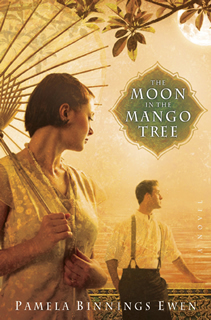 Set in Siam and Europe during the 1920s, a glittering decade of change, The Moon in the Mango Tree is based upon the true story of Barbara Bond, a beautiful young opera singer from Philadelphia who is forced to choose between her fierce desire for independencea desire to create something of her own to give purpose and meaning to her lifeand a deep abiding love for her faithful missionary husband whose work creates a gap between them. But when you choose between two things you love, must one be lost forever? Pamela Binnings Ewen practiced law for twenty-five years before following in the authorial footsteps of relatives James Lee Burke (The Glass Rainbow) and Andre Dubus III (The House of Sand and Fog) with novels like The Moon in the Mango Tree, winner of the Eudora Welty Memorial Award in the 2012 Biennial Letters competition. Her third work of fiction, Dancing on Glass, won the 2012 Single Titles Reviewers Choice Award and was a Christy Award finalist.